An extremely troubling report was released last week by the Annie E. Casey Foundation. In its annual KIDS COUNT data report, researchers found that North Carolina is now ranked at a dismal 35th in the nation for the overall well-being of its children. The KIDS COUNT report ranks each state on performance in four specific areas: economic well-being, family and community, health and education. Sadly, North Carolina dropped one place since last year’s ranking came out. So, what really caused this disturbing trend? It’s really no secret that North Carolina is struggling economically. Essentially, the state has extremely high unemployment rates and, for thousands who hold jobs, the wages don’t pay nearly enough to break the poverty line. It’s a perfect example of the “haves and the have not’s”. The state is currently ranked 38th in the nation for economic well-being, which is three spots lower than last year. The economic rating is developed by examining four categories and North Carolina failed to improve in any of those four over the last year. The state’s drop to the 35th spot is essentially due to its inability to improve any area of economic well-being. 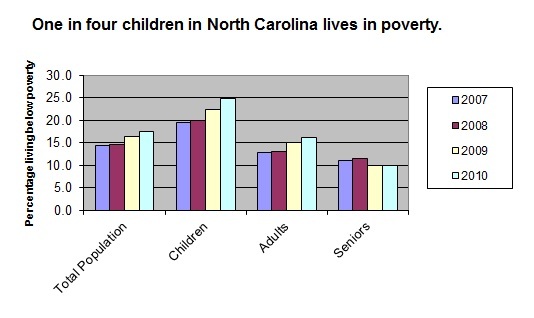 According to the data from KIDS COUNT, 26 percent of North Carolina’s children are living in poverty. The reason for that is the 34 percent of parents who lack any form or promise of secure employment in this state. While North Carolina’s Triangle area is likely teeming with job opportunities for engineers and computer majors, the bulk of the state’s unemployed certainly don’t benefit from these job openings. Only a small community of people are qualified for these kinds of jobs, leaving thousands of families stuck in the long-term unemployment cycle. One of the most disturbing effects of North Carolina’s unemployment epidemic is the effect it has on the children. This is especially true for children of the long-term unemployed. 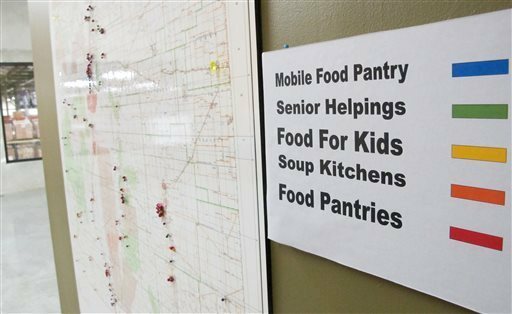 In fact, the KIDS COUNT report found that the number of children across the nation who are living in poverty actually rose 23 percent from last year. More than 4 million workers in the United States have been without a job for over six months, while there are 3 million who have been out of work for over a year. Poverty has now risen to such high levels that it is essentially doing away with the middle class. Now that North Carolina has done away with its federal emergency unemployment benefits, it only stands to reason that the unemployed within the state will suffer some serious repercussions. Unfortunately, they are not the only ones who suffer in this scenario. Their children will pay as well. When parents have absolutely no income to rely on, how can they possibly care for their children in a way that promotes their well-being? In addition to children suffering from the effects of unemployed and financially struggling parents, the KIDS COUNT report found additional concerns. The state’s ranking dropped two spots in the education department and eight spots in health. In fact, the study found that 10 percent of North Carolina’s teens are currently either not working or not attending school. Although the state did make some very small improvements in a few areas, they were not enough to keep up with the improvements made by other states. As a result, North Carolina is not considered among the best places to be a child right now due to the disadvantages they must face economically and educationally. Parents who find themselves unable to pay the bills, financially stretched beyond their limits and struggling to provide for their children often feel like there is no light at the end of the tunnel. Maybe you’re constantly worried about losing your home? Or perhaps you’re just counting the days until they turn your family’s electricity off due to unpaid bills? If this sounds familiar, it’s time to do your family a favor and schedule a consultation with an experienced North Carolina bankruptcy attorney. Filing for Chapter 7 bankruptcy protection can mean the difference between living in daily financial turmoil and starting with a clean slate. Not only do you deserve a fresh start…so do your children.